Driving during tough winter conditions in Colorado is tricky, so to curtail those risks as much as you can, follow these eleven trips for safe driving. Have your engine tuned-up at the mechanics. Confirm that all lights are working and that the headlights are clear. Have the battery checked. Clean any corrosion with water and baking soda. Ensure that all fluids are at their appropriate levels. Either use all-season or winter oil. Have the wiper blades cleaned and/or switch to winter wiper blades. Make sure tires are inflated and have good traction – snow tires go a long way. To prevent carbon monoxide from leaking into the car when the engine runs, you must always make sure that the exhaust pipe is never clogged with ice or snow. Make it a habit to check this every time before driving anywhere during the winter. 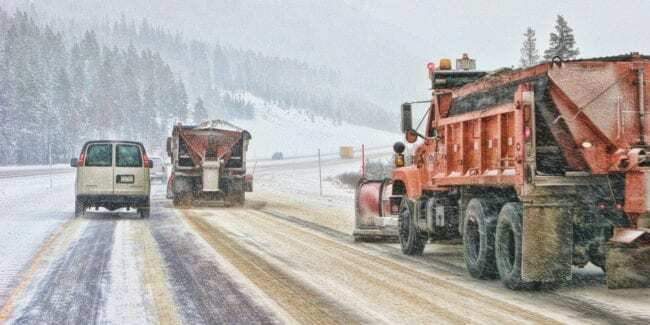 Winter driving conditions in Colorado have the potential to change in an instant. You can’t assume that just because the sun is out now, the weather won’t turn into a nasty blizzard later on. Plan ahead and be prepared for any type of weather that could arise. CDOT has an invaluable website, COTrip.org, which allows anyone to watch live traffic cams across the entire state. This way, you’ll be constantly informed of road closings, weather conditions, and traffic. You can even download a free mobile app. There’s no denying that cruise control is a very nice feature to have when driving in normal conditions, but in the winter the dynamics change and using cruise control is unfortunately unsafe. If your car skids it will accelerate by spinning the wheels, because it’s trying to keep up with the predetermined speed. This makes it significantly more difficult to control the vehicle if such an event were to occur. You’ve probably heard before that you should keep your car’s gas tank above half full at all times in the winter. This avoids gas line freeze and will give you plenty of gas to keep your car heated if you’re stranded. Driving too fast is easily the number one cause of winter driving accidents. Icy roads that may not look icy, de-iced roads that could still be slippery, low visibility, and other moving vehicles are all good reasons to slow down on the road. Don’t tailgate and keep an eye on your rearview mirror to make sure nobody gets too close to you. Contrary to what many people think, you shouldn’t warm up your car by idling the engine. This will only worsen your gas mileage, potentially cause damage to your engine and won’t warm up your car very quickly. The right way to warm up your car is to drive it. This doesn’t mean you should power out and get to the top of a hill as quickly as possible, but it does mean that you need to gain inertia on a flat surface before reaching the hill to carry you to the top. Once you make it to the top, slow down and proceed very slowly. It’s a very empty feeling to be stranded in your car out in a remote place, but as long as you know what to do when you’re stranded, help will eventually come and you’ll be rescued. Never wander from your vehicle. The only times you should leave the vehicle are to tie a colored cloth to the antenna to signal for help, and to routinely remove any snow from the tail pipe to prevent carbon monoxide buildup. Run the engine for five or ten minutes every hour to keep you warm, and remove any snow or ice from the tail pipe. You can set a candle on fire in the cup holder for extra warmth, though remember to open one of the windows just a little to keep your car from becoming air tight. Please share any other winter driving tips. Nicholas is an outdoorsman who writes on survival, nature, hunting and self defense topics for a number of related websites.